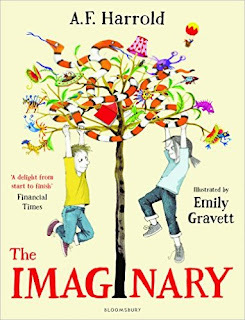 Imaginary friends seem to be even more popular than usual, with a number of recent children's books - Beekle the Unimaginary Friend by Dan Santat won the 2015 Caldecott Medal, Imaginary Fred by Eoin Colfer and Oliver Jeffers are two of the excellent picture book examples. 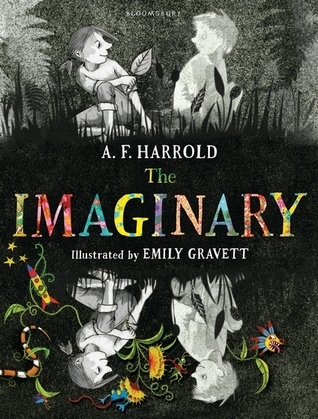 The Imaginary is for an older reader, but still with some gorgeous illustrations from the marvellous Emily Gravett (another on my Top 10 Illustrators list) separate the good characters (with their sweet turned up noses and wide eyes) and the bad with their shadows and blacked out eyes. Amanda Shuffleup (excellent name!) has an imaginary best friend Rudger, and they have a great time together, until a suspicious someone comes to the door - Mr Bunting, apparently conducting a survey but in fact with more sinister intentions. When Amanda has an accident Rudger is in danger of disappearing and taken in to a home for invisible friends with no friends, if you see what I mean. How it all works is a little complicated but the puzzle fits together well as you make your way to the end of the book. There are some distinctly scary moments and you won't want to put the book down until all is resolved. I ended up with two copies of the book, the paperback, with it's rather cheery yellow cover which does reflect the happiness of the relationship between Amanda and Rudger, and the hardback with the dark shadowy cover, which to my eye is rather more enticing and reflects the sinister undertones of the story. Take your pick! The dark cover features on the author's website and Emily Gravett's website has information about all her books. Here she shows us how she draws the imaginary girl in The Imaginary.